Up and coming Nigerian striker, Henry Onyekuru said he is expecting a return to Everton from where he was loaned to Anderlecht . summer. 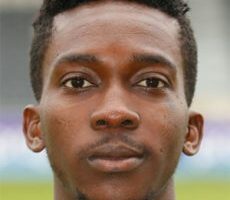 Henry Onyekuru. Onyekuru who has taken his goal tally to six in nine games for Anderlecht said Everton are happy with his progress in Belgium and wouldn?t rule out a return to the Toffees in January. Onyekuru registered a brace in Anderlecht?s 4-3 over Machelen last Friday. ADVERTISING ?Everton are happy about my development,? Onyekuru told Het Laatste Nieuws. ?I?m expecting something. ?I?m hoping to go to Everton in January,? he concluded. Onyekuru?s virtuoso showings might influence Koeman to bring him back early with Everton strikers struggling to replicate Romelu Lukaku?s feat. Checking the spread of ?monkey pox?